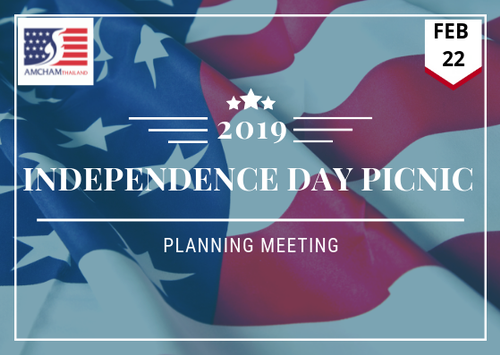 The American community of Bangkok is preparing once again to celebrate Independence Day with a traditional community picnic event hosted by AMCHAM at Bangkok Patana School on Saturday, July 6. We invite anyone interested in participating in this event or contributing ideas to join our planning meeting on February 22rd. Become a Star Sponsor on our U.S. Flag! For a Baht 10,000 donation, you receive 10 compimentary tickets and your logo is featured in all promotional materials for the event, on our website, and in our T-AB Magazine. Donate raffle prizes for our Charity booth raffle. All proceeds from these activities support the American Chamber of Commerce in Thailand Foundation (ATF) student scholarship program. Prize donors will receive recognition at the event, in our quarterly T-AB Magazine, and on our website. We will have food and other vendor opportunities available. If you are interested in any of the above, please contact Kittie at kittie@amchamthailand.com.